I've blogged about the recording I've been doing with the Arop Lokep language. Weeks of recording staggered over several months. This week we finished the post-production of the NT recording, and have begun compiling it into Audio Bible players. We are on schedule for a June dedication that will have both the finished print version AND the audio version. This is a huge deal. Not only is there a printed version, but right along side of it will be the audio version. I am excited about that. If all goes to plan I'll be able to be there at the unveiling. "I wasn't expecting such a powerful reaction when I handed Sakaria a copy of the newly printed Arop-Lokep New Testaments. It wsa the first time for him to see the finished product. He held it up like an offering to God and with tears brimming in his eyes said, "Thank you Christ." Then he turned to me and overcome with emotion, simply shook my hand. 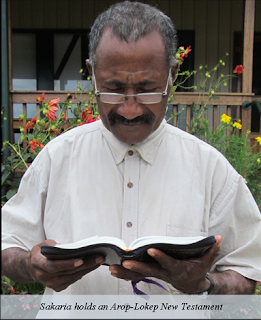 Only then did he unzip the cover and begin to read God's Word in his own language. That's powerful! I can hardly wait to show others around Long Island a copy of the New Testament and a sample of the now completed New Testament audio recording on an Audi Bible player." This is my homemade cooling unit at work. 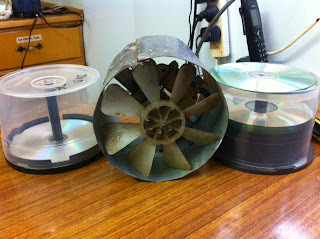 It is a high speed electric motor, with a fan, put into a home-made sheet metal casing. Originally created to simulate fire for some activity, where an orange cloth would be attached to it and set upright to make it 'flicker'. I inherited it when a friend went home finish. I inherited a lot of odds n ends to be made into something else. Yesterday I returned to my office after a 7 week absence. I had been in recording sessions for 5 and board meetings for 2. Years ago the windows in my office were replaces with pane glass, because we are at or under ground level with a popular road. Which means we were getting dust into our equipment all the time through the louvres. So currently I sit at the end of a tunnel like office structure, with only my AC unit to give me an environment in which I can work. I have too much work to accomplish to miss being in the office any longer. (2 NT to post produce to Audibible and a video to edit). So, I traded my work pants for shorts, my work shirt for a t-shirt, my shoes for 'crocs' and brought my makeshift fan into work, propped it up with 2 cd bundles and went back to work. It's still warm, but I can at least get a little work done. Even if my forearms are sticking to the desk. have responsibilities that will take the next few weeks. 13 weeks until we get on a plane to return to the U.S.
the way discovered a few skills I didn't know I had. strong, only my time on that team has come to an end. God sometimes challenges us to say 'yes' to things that frighten us. is directly related to how much fear you felt before accepting it. Over the past year I've been working with a lady named Beth to compile media for showing and listening to in her language area (16 different languages). For those who don't know what the Jesus Film is (and I didn't either before coming here), it's a movie based on the book of Luke about Christ and his ministry, death and resurrection. We take that film and dub it into local languages so they aren't hearing it in English (or Hebrew). It is very powerful as people see Christ speaking in THEIR language for the first time, and often the showing of this film changes lives and opens eyes and hearts. Please pray for Beth and seven YWAM team members as they finish showing the tokples Jesus Picture Story DVD almost every other night in 16 villages of the Aitape West Translation Project for the last 6 weeks. They are focusing this time on the two largest language groups in the project. They visited 10 communities in the Malol language area and 6 communities in the Sissano language area. They finish their program tomorrow evening and will travel to Wewak on Monday. Please pray for safe travels by boat along the coast early in the morning before wind and waves pick up, and for them to be able to meet the plane. Please pray for Beth. There have been some rumours preceding them regarding her skin color and the spiritual context of white-skin. I prefer not to get into specifics on a blog, but the rumors need to be squelched for her ministry to reach people and be clearly understood. Media is powerful, let's make it about something meaningful! visiting new places and churches and people. time doing fund raising, because we want to spend time with family. Today we had the money talk. See if you see God's hand like I see God's hand. other people to increase giving or to start giving! number to me. Long story short, I love 3's. raise monthly, and it's $333 p/month. everything is going to be alright!!!! to tell people about the good work going on here in PNG!